2. 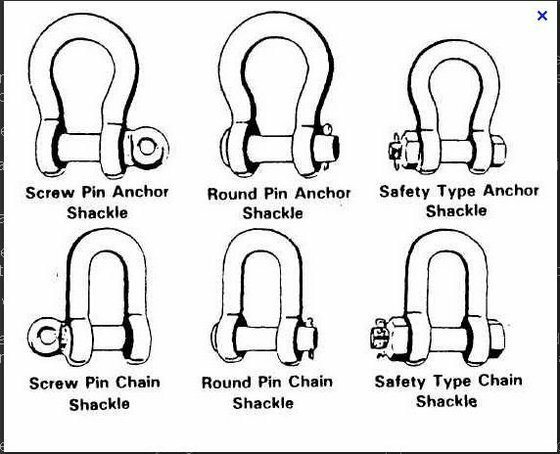 Shackles are used in lifting and static systems as removable links to connect (steel) wire rope, chain and other fittings. 3. Made of two connecting pins press fitted and and riveted in one plate, connecting links have multiple applications and cost effective. 4. Screw pin shackles are used mainly for non-permanent applications. 5. Safety bolt shackles are used for long-term or permanent applications or where the load may slide on the pin causing rotation of the pin. Professional designer team. Mother company was established in 1993 in Wenzhou ZheJiang province. We devote ourselves to build our eternal brand: DURASTARK. Combined Durable and German word Stark means strong. In order to make further development and better to take advantage of the preferentialpolicy that issued by Shanghai Free Trade Zone, we have successfully registered aÂ Shanghai branch for Zhejiang Rilong Metal Products Co., Ltd. called DuraStark Metal Corp.Ltd.in May 2014, which is specialized international trade of hardware products. Q: Do you provide samples ?Â is it free or extra ? Â Q: Can you make customized items? A: Yes. Please provide us the samples or the sketches, then we could assist you! Q: Do customized items charge extra money? A: Yes. Because aÂ new mould is needed to make for the customized item. Q: How can IÂ trust you and your company? A: We have aÂ factory and own physical stores with more than 20 years experience, so we have ability to assume the risk of the products quality. Q: Are your products good quality? A: Absolutely yes. Quality is our culture! We could control and promise every step of the production process. A: Generally two weeks or so. Actually it is according to your order quantity. But we could rush the order if you need urgently. Q: May IÂ have some samples for checking before ordering? A: Yes. Samples are available if freight cost is prepaid. Q: How will you solve when your factory do not have our styles? A:There will be two methods. One is to make aÂ new mould as your design, another is when you need urgently and we do not have enough time to make aÂ new mould, then we could assist you to find the products from other metal factories. Q: Are there any advantages at the product price? A: Yes. We provide competitive factory direct price! Exhibit China International Hardware Show in Shanghai every year. Exhibit the Cologne International Hardware Show every two years in Germany, Cologne. Besides the above three regular shows, we also attend the Dubai Big 5Â Hardware Show, Las Vegas Hardware Show and Brazil Feicon Hardware Show, Mexico Hardware Show and Russia Hardware Show. This is Linnie Chan from DuraStark Metal Corp. Briefly introduce our company, We are one of the leading manufactures (Zhejiang Ri long Metal Products Co., Ltd) in China, Durastark is our brand. We have started the hardware business since 1992, we've been expanding every year with volumes, sales and product ranges. We started with all kinds of pet hardware, now we have more range of hardware in furniture hardware and rigging hardware, because we have our own R&D department for making new molds, so we help customers to make customized different new types of product and packaging, we do all kinds of packaging like printing logos, QR codes, blisters and etc. Moreover, there are plenty of raw materials to be widely used such as zinc alloy, bronze, steel and aluminum alloy, etc. Please feel free to visit our website www.durastark.com for more product ranges, if you find something catch your interest, just tell me their item numbers and specifications, IÂ will quote you the best prices. Lastly, IÂ wish you and your company good luck on this year, hope we can start cooperating in the future.